I’m a science presenter based in the UK and working all over the world on science based videos and stage shows. I originally qualified with a degree in Physics from Imperial College London and still help with engagement there as an Honorary Outreach Lecturer. Alongside presenting, I also teach science communication for researchers and offer training in scientific thinking and decision making in the corporate world. I also work in education, specialising in improving interest in science, through Science Theatre. My work is a mix of science presenting, theatre and educational projects. Have a look through a selection of my more recent work below or take a look at the training I offer. Science/Mystery is a one-man stage show of science and psychology, exploring what we know about the universe. Tabletop Science is an unusual idea for science and technology themed corporate entertainment. Theatre-based science shows for festivals and schools. 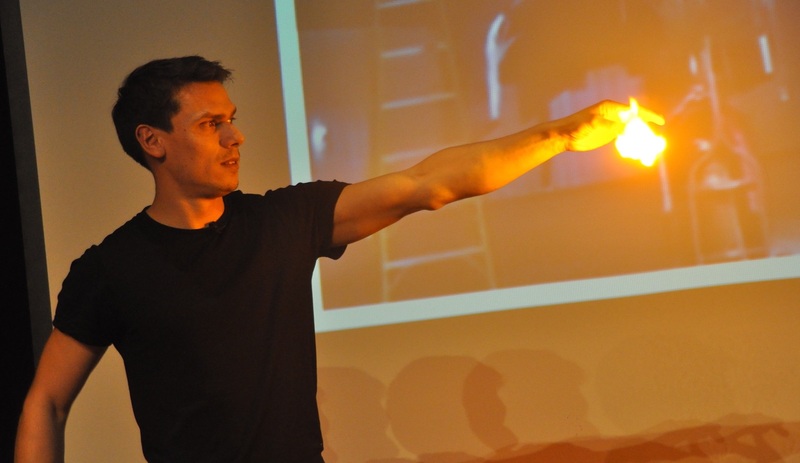 PowerUp is an interactive science and gaming show where the audience control the outcome. Science video presenting from the slopes of an active volcano. I present for screen on a number of projects. If you'd like to discuss working together, or for training or performance booking enquiries, or just to say hi, drop me a message via the form or the email address below and I'll get back to you as soon as possible.